Season Tickets for the 2019/2020 campaign are available to purchase now. This season to show our thanks to all of our supporters we are introducing a new early bird offer which will entitle our supporters the opportunity to save up to 15% on the purchase of their Whyteleafe season ticket. Early bird pricing is available until Tuesday 23rd April 2019. 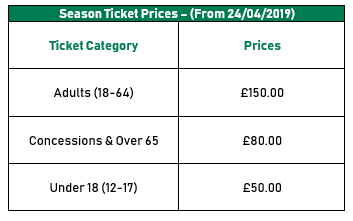 A Season Ticket continues to offer the best and most affordable way to watch every Whyteleafe home league fixture at Church Road next term. 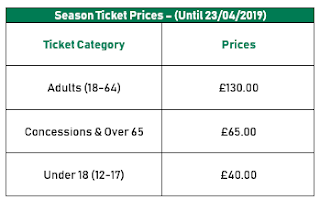 Purchasing a Whyteleafe FC Season Ticket for the 2019/2020 campaign enables you to save throughout the season. Your season ticket guarantees your seat for all home Bostik South Eastern league matches. (Cup matches and friendly matches do not apply) Becoming a season ticket holder automatically gives you Whyteleafe FC membership status (Cost of £15.00 without a season ticket) which entitles you to a 5% discount on drinks at the bar and the opportunity of attendance and voting at the clubs AGM. Application forms are available to collect from the club office in person or can be sent via email and returned to the club office. 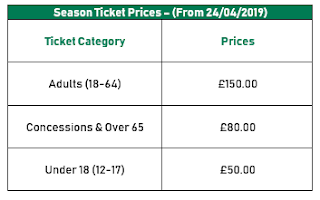 For any more information regarding purchasing matchday or season tickets at Whyteleafe Football Club or if you wish to receive an application form please contact Harry Martin at harry.martin@whyteleafefc.co.ukor telephone 020 8660 5491.